About a week ago, I held my first workshop where I used a kit as the creative inspiration and it was loads of fun! Before the group arrived, I opened the Everyday Occasions kit, laid out all the card bases together and displayed the stamps and embellishments from the set. Then I added scissors, adhesive, and the two full size stamp pads that matched the ink spots (Island Indigo and Basic Gray). I also put out the Stampin’ mist and Stampin’ Scrub so they could easily change ink colors whenever they wanted. Once everyone arrived and settled in, I covered a few card-making basics, including how to use the glass block for clear stamps, put the stickers on them, and how to use snail adhesive. Then the fun began! After I showed the kit contents, the ladies each chose one of the card bases, picked their favorite stamp, and attached its sticker. They quickly set to work picking an ink color and embellishments for their creations. Surprisingly, nobody really used the sample sheet the kit provided! Some made 2 cards, or even three. When the cards were finished, there was “stuff” everywhere! It looked like this picture but with 4 times as much mess! Have you ever met a neat stamper? Are you one? I’m definitely not! I might mention here that in addition to the pieces included in the kit, I brought out my stack of leftover pieces from previous projects and let them use those as well. It was a blast! (If I get the opportunity to do it again, I’ll have to remember to take pictures of the happy chaos and everyone’s cards). Once everyone’s orders were completed, I was delighted to see that two people had added a kit to their order. For new stampers especially, I think the kits are a really good value. 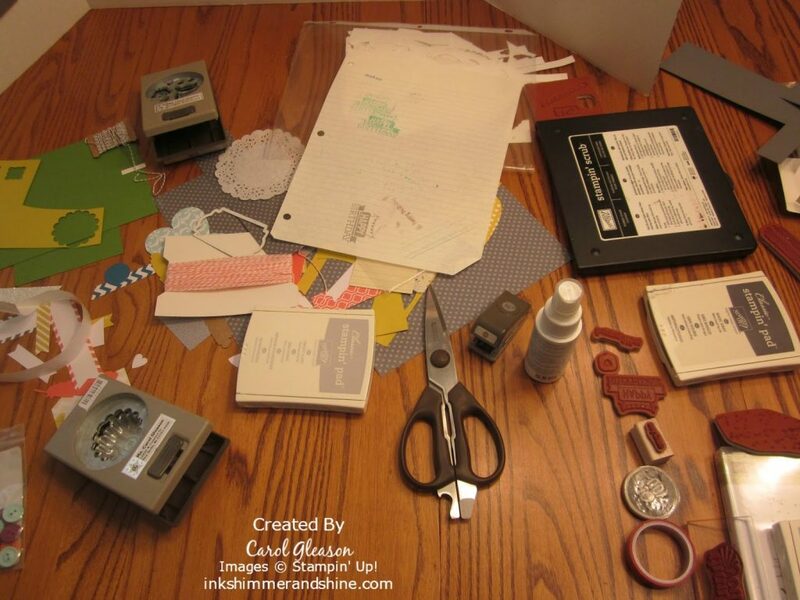 Card stock, ink, embellishments, baker’s twine, samples and even some Stampin’ Dimensionals are included, so the fun can begin right away. Since there are many punched pieces to choose from, the kit is perfect for anyone whose punch options are limited by budget or space as well. 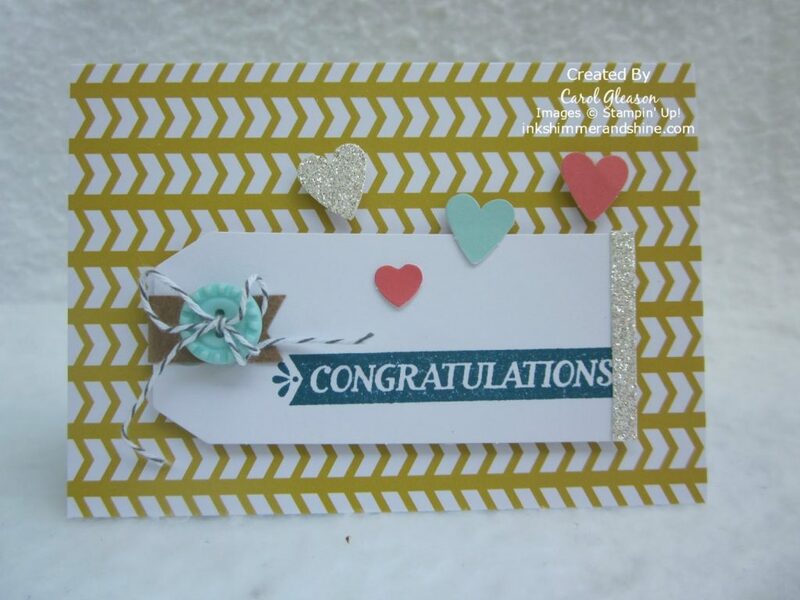 Card #1: On the Kraft congratulations card, I substituted a feather for the scalloped circle below the sentiment. Card #2: On this Thinking of You card, I swapped Summer Starfruit heart for the green one shown because I wanted it to stand out. 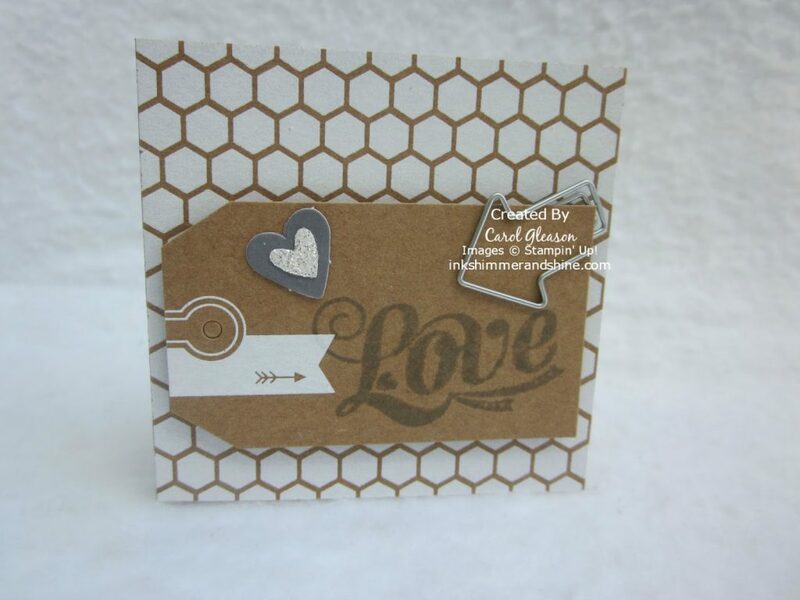 Card #3: For the 3×3” hexagon patterned kraft card, I changed the tag & sentiment, left off the twine and added hearts and a cute clip. The small heart was punched from the scrap silver glimmer paper in the kit, using the owl builder punch heart. 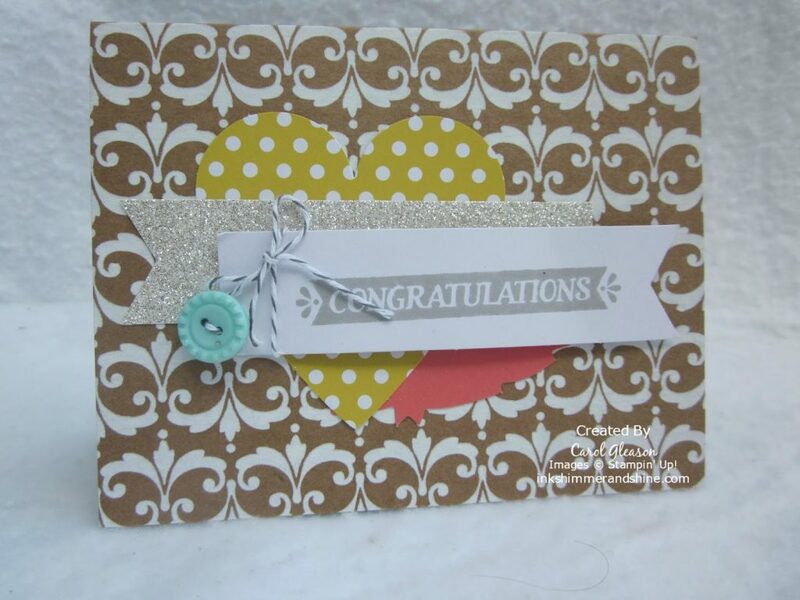 Card #4: The second Congratulations card has one additional mini Calypso Coral heart, which I think came from the Framed Love Paper Pumpkin kit. I hope you enjoyed your visit. Stay tuned for more samples in my next post! If you need information or would like to order any of these items the links are listed below. Thanks for visiting!